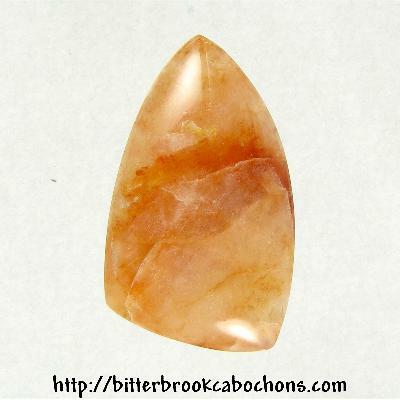 This freeform Brookwood Stone cabochon is fairly well fractured, but very stable. I could not break it, but if you can, I'll refund your money. Depending on how I look at the photo in my monitor, the color goes from peach to orange, but the cab's primary color is in fact peach. 38mm x 23mm x 6mm. Weight: 44.55 carats.